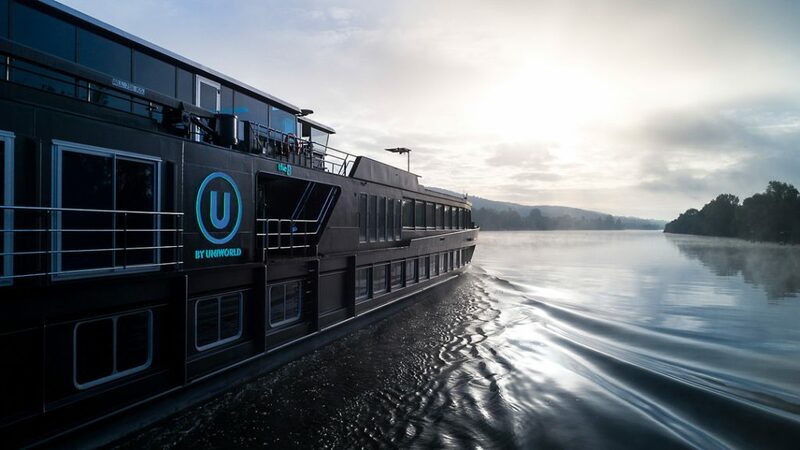 Last month I was invited by Uniworld’s new sister company “U by Uniworld” to test out their new concept in river cruising – millennial river cruising. I was one of a group of influencers and bloggers that set-sail on the maiden-voyage of “The B”, the first ever cruise just for millennial’s. I didn’t know what to expect when taking a millennial cruise! If you’ve never heard of this concept – that’s because it’s brand spanking new. But don’t fret! From the ship, to the rooms, to amenities and tours – I’ve got you covered on what to expect when taking a millennial cruise! 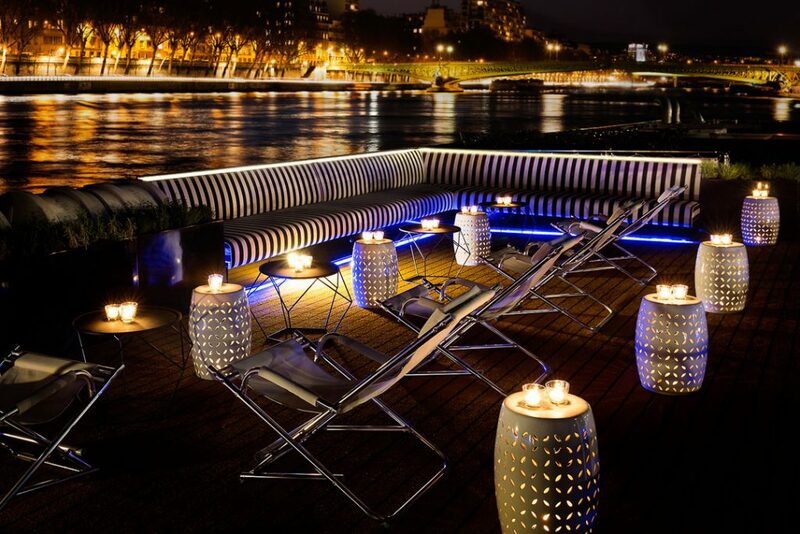 U By Uniworld was created to cater to a generational gap in river cruises. Most river cruises cater to a more sophisticated (read: older) crowd and are subsequently out of the average millennials budget. Uniworld didn’t think this was fair! Why shouldn’t millennials be able to afford cruising along Europe’s rivers? Enter U by Uniworld. Created specifically for millennials – you have to be between the ages of 21-45 to board and depart with U by Uniworld. And trust me, once you experience the ease of traveling along Europe’s rivers, hopping from city to city – while only unpacking ONCE, you may never want to go back to trains and busses. When I was boarding the first millennial cruise – I didn’t know what to expect from the ship. In my mind I had envisioned the typical white and wood ship that cruises the European waterways. I thought that the interior design would resemble that of a typical cruise ship. I completely disregarded that U by Uniworld is not your typical cruise. The B was sleek and stylish – painted all black with LED lights (that changed, daily) displaying the company and ship names: “U by Uniworld” and “The B”. The black exterior was carried on into the interior which was designed like a boutique hotel! 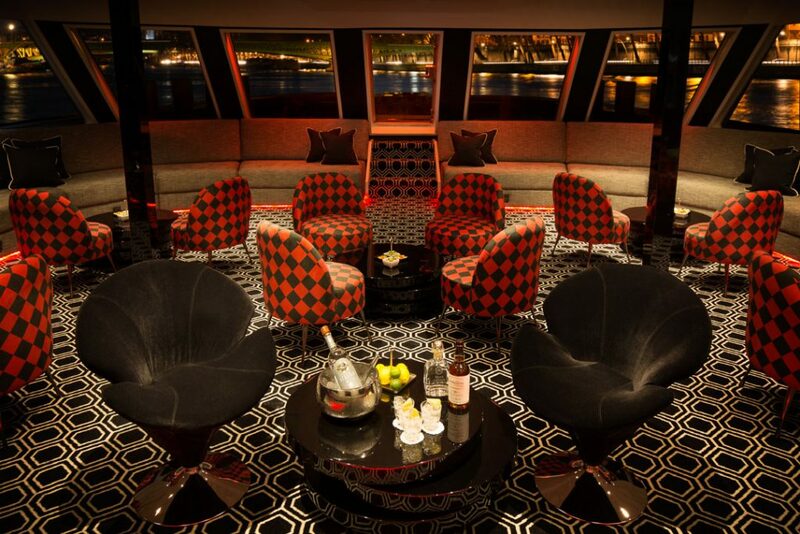 Chic black and white striped and checkered patterns adorned all corners of the ship, including the rooftop Ice Bar, the restaurant, and the lounge, with pops of fun red to compliment the trendy black and white. The B looked sleek as it made it’s way down the river. Who wouldn’t want to hang in this lounge with a drink while beautiful scenes pass you by?! 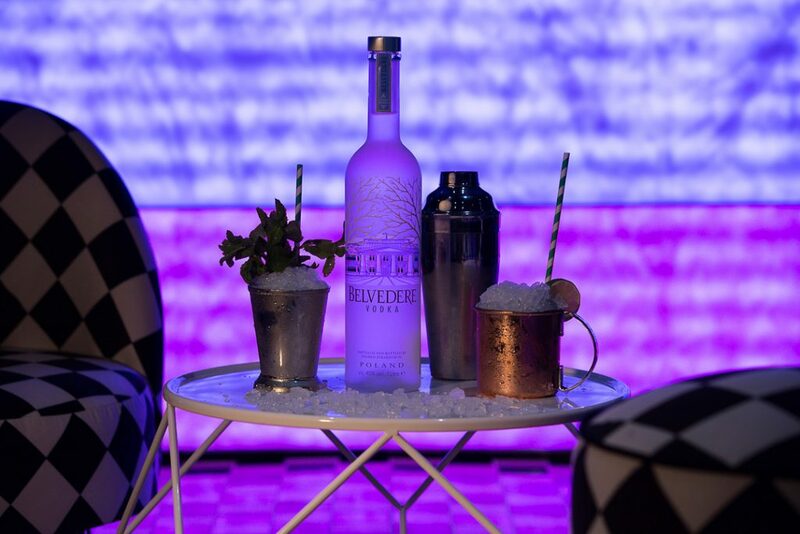 The ice bar ready to go for your evening party! The restaurant where breakfast, brunch and dinner are served. The outdoor rooftop seating area. A view of the Eiffel Tower right from where we were docked! 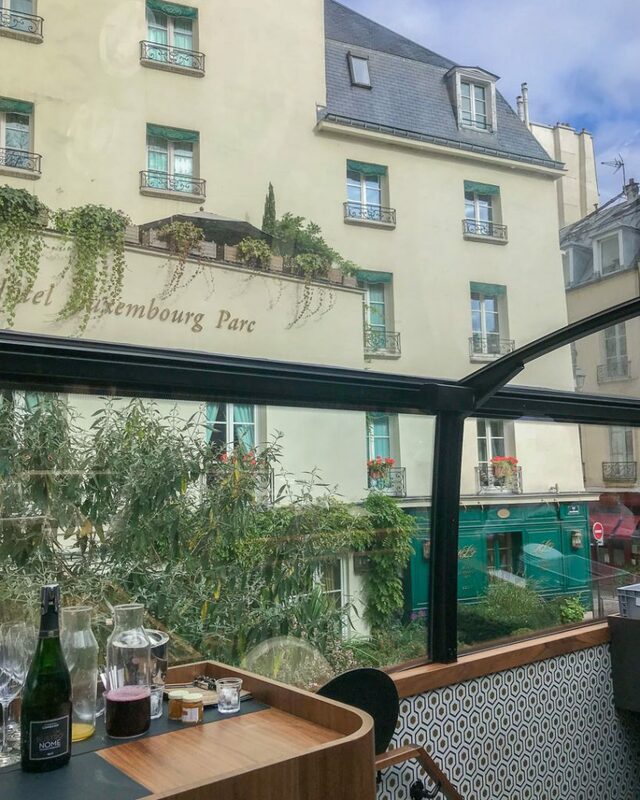 I had the pleasure of staying in a French balcony room that came with a double bed, two large closets, a small desk, two huge storage cabinets on either side of the bed and a private bathroom. 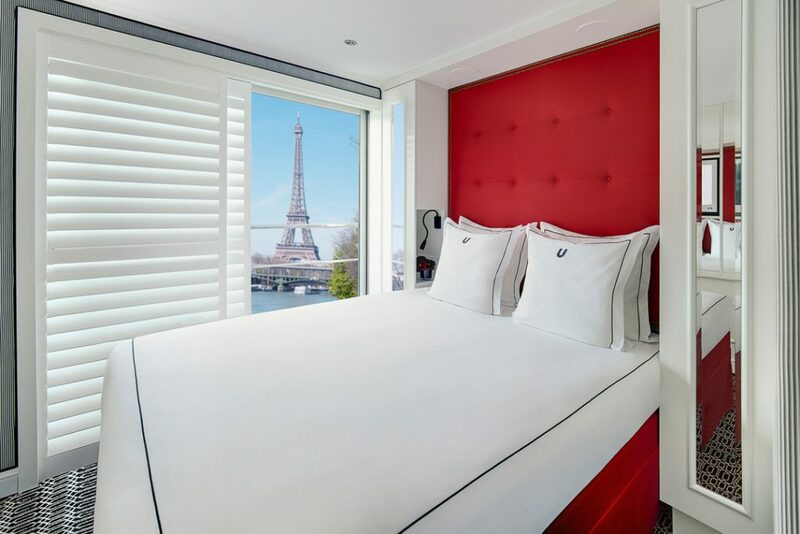 I’ve been on a few river cruises and the balcony room on The B was a bit smaller than the average river cruise room – but comfortable nonetheless. The mattress on the bed was like sleeping on a cloud! The plush Savior mattress is definitely-worth noting. There was also a flatscreen TV in the room that came with free movies! What?! I know. Usually movies are sold at a hefty upcharge so it was nice to see that U by Uniworld went ahead and made those inclusive. There was also heaps of outlets for all of your devices as well as a few USB ports and surround sound Bluetooth speakers. Simply connect your phone and hear the music play throughout the room! The setup of my balcony room. The mirrors to the left and right of the bed open up to floor to ceiling shelves. 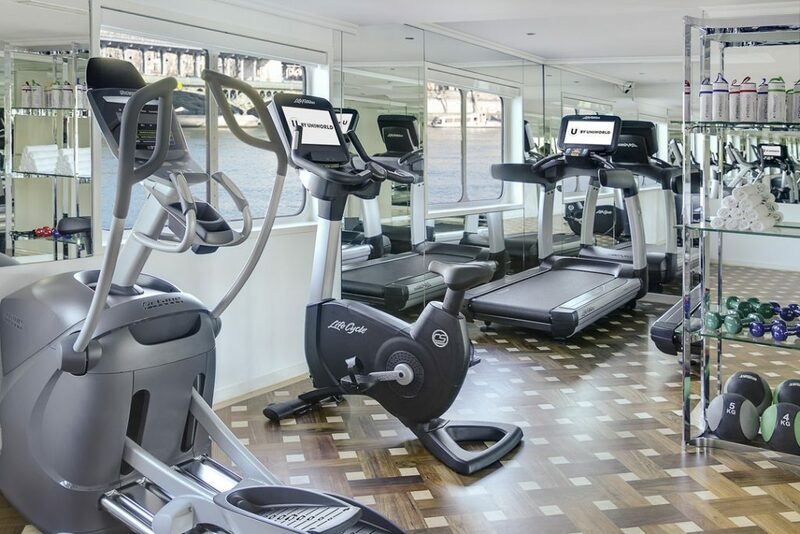 The B was jam packed with amenities such as a full service gym and spa. There was also beverage (alcohol, coffee, etc) and snack services in the lounge and room service if you wanted to indulge in your room! The huuuuuge on board gym. One of my favorite amenities was the daily brunch. U by Uniworld knows that most millennials like to sleep in and subsequently – miss breakfast. Their solution? To serve brunch from 11a-2p everyday! Brunch was for sure my favorite meal of the day on The B. With everything from fresh salads, cheese boards, crostinis, eggs, cakes and muffins and heaps more – it was hard not to find something you’d like to indulge in during brunch. Breakfast and dinner are also served aboard The B! Breakfast is a tad more modest than brunch – but still delicious nonetheless. Dinner was served family style every night with fixed dining options. Many of the meals were served with farm-to-table cuisine and often mimicked the style of the food from the area we were in! 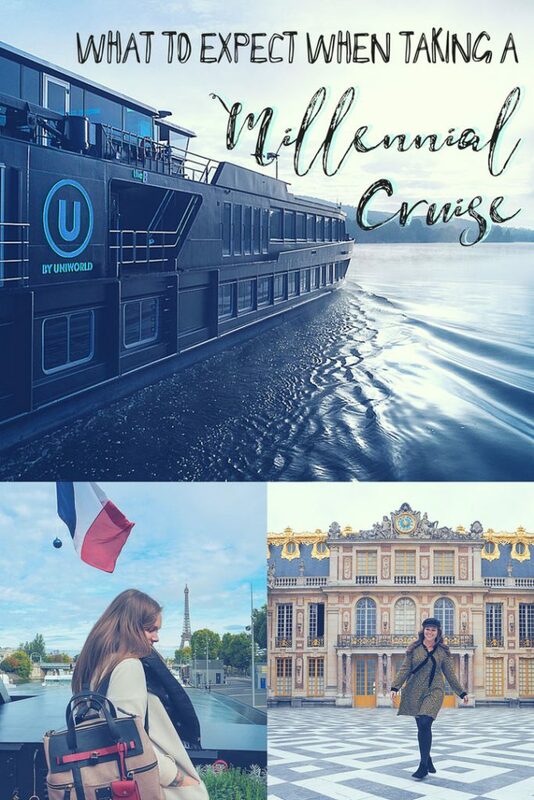 U by Uniworld totally created their onboard activities to millennials. While sightseeing is definitely-high up on the list of things to do on-board, they also schedule daily activities to participate in. While I was on The B there was morning yoga offered atop the ship in the ice bar. 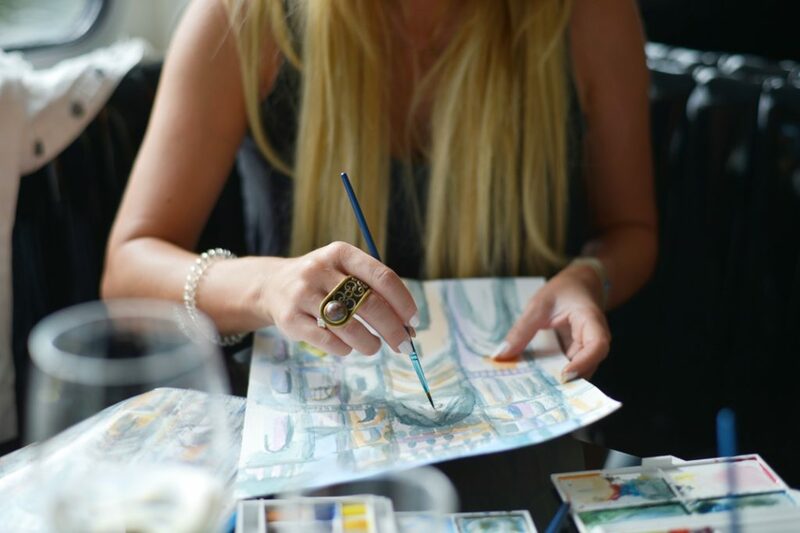 One of my favorite activities offered was a paint and sip class! Sit back, relax, sip some wine and paint! If you’re more into the sipping and less of the painting you could opt for an onboard mixology class. Scenes from the paint and sip! Each night there’s also a party! This is, after all, what you should expect when taking a millennial cruise. The Lounge boasted a bustling scene each night and some nights there were planned parties such as a silent disco and a pajama party! 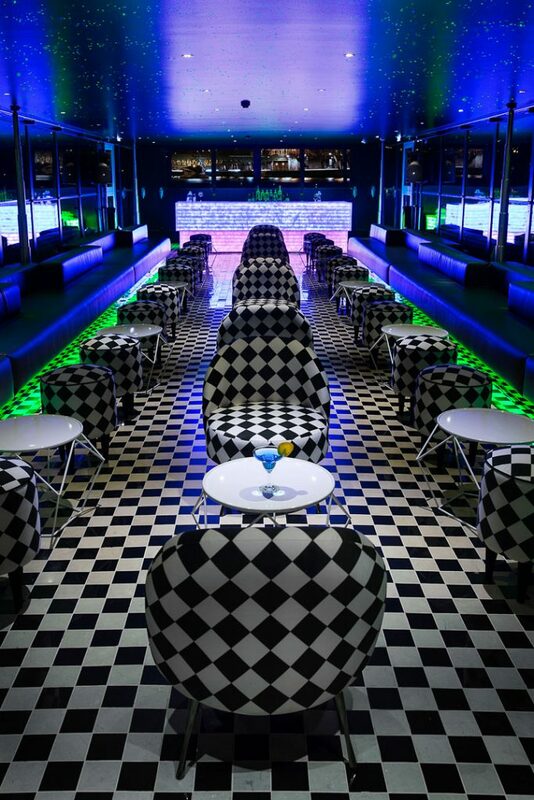 Get your party pants on and prep to make your way to the ice bar! Each day (and sometimes night!) there are a variety of different tours offered and the best part? You don’t have to do anything if you don’t want to! 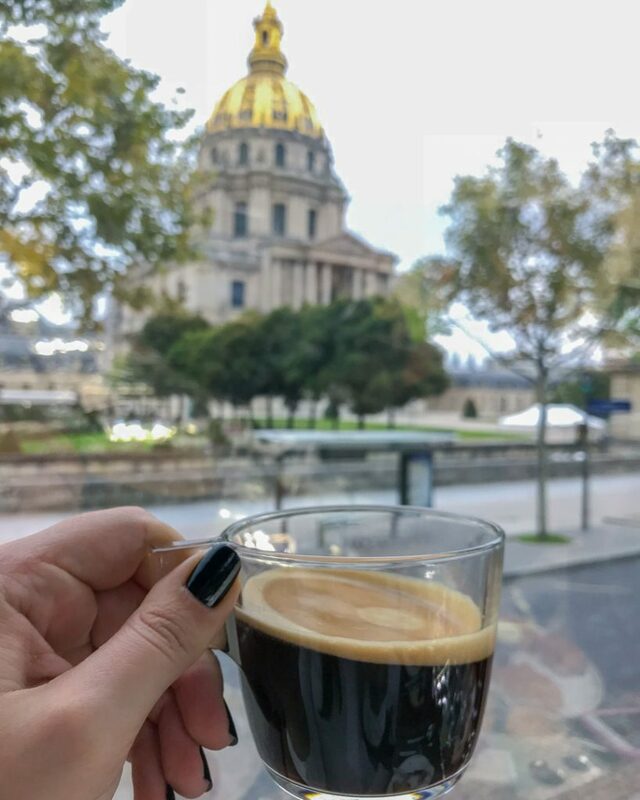 While the organized tours are a great way (and in my humble opinion, the best way) to make good use of your time in a port – if you want to opt to go off on your own, you can! My first night on The B I opted for the nighttime Eiffel Tower tour. 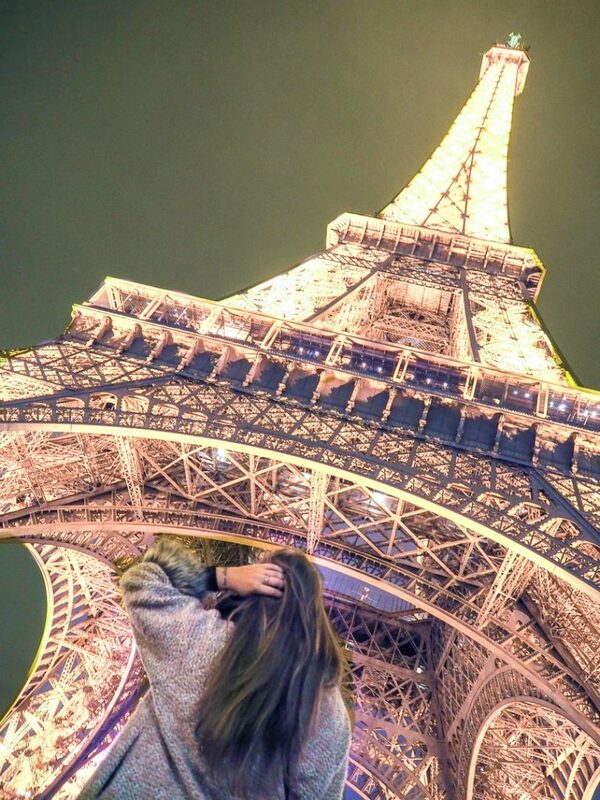 The ship wasn’t docked far from the Eiffel Tower so we walked over to the tower to capture it in its glimmering glory! We gathered by the entranceway of the Tower and were given our tickets. From there we were on our own, which I loved. We were given just enough information about the tour and the evening but not too much to where it felt like a high school field trip. If you go to Paris and don’t take a picture in front of the Eiffel Tower, did you even really go to Paris? My first morning on The B I opted for the super fun Brunch on a bus! 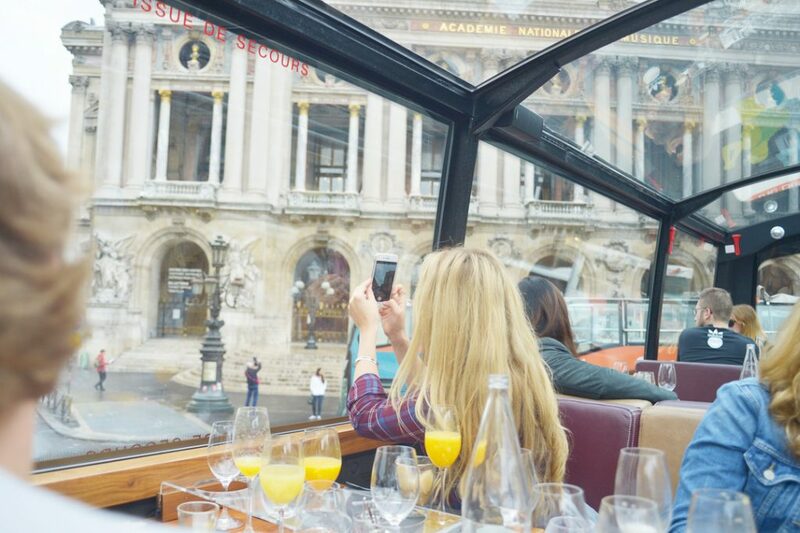 I’ve been to Paris a bunch of times but I’ve never heard of brunch on a bus. Naturally, I had to opt in. The bus met us right outside the ship and we made our way to the top where we were greeted by a complete glass ceiling. We were served a four-course brunch while driving around the city. 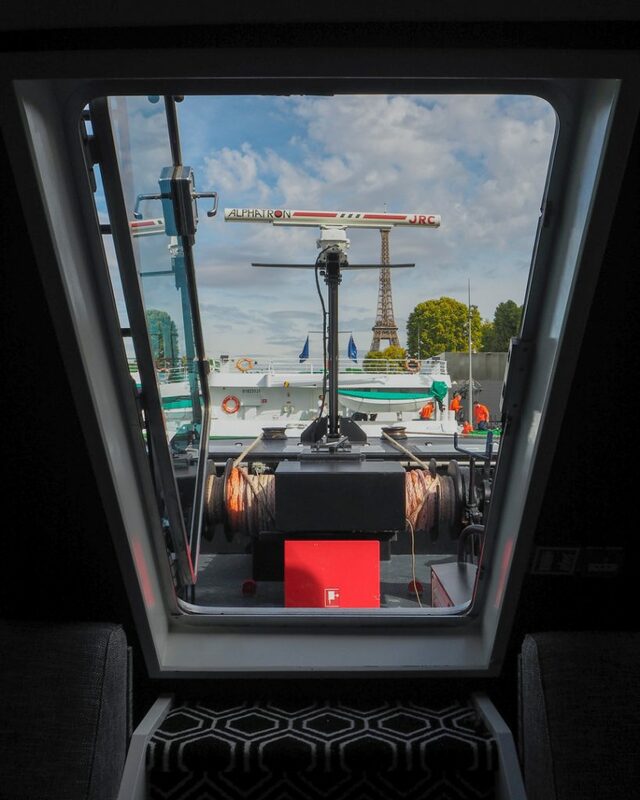 Talk about taking in the views of Paris! Cameras were out left and right on the bus-brunch tour! (left) Coffee with a moving view! (right) Some of the views and hues I captured during the bus ride. The afternoon tour I opted for was “Rooftops of Paris”. U by Uniworld totally catered to millennials with this roof-hopping tour. From one roof with gorgeous Parisian views to another we made our way around the city taking in the views and hues of Paris. 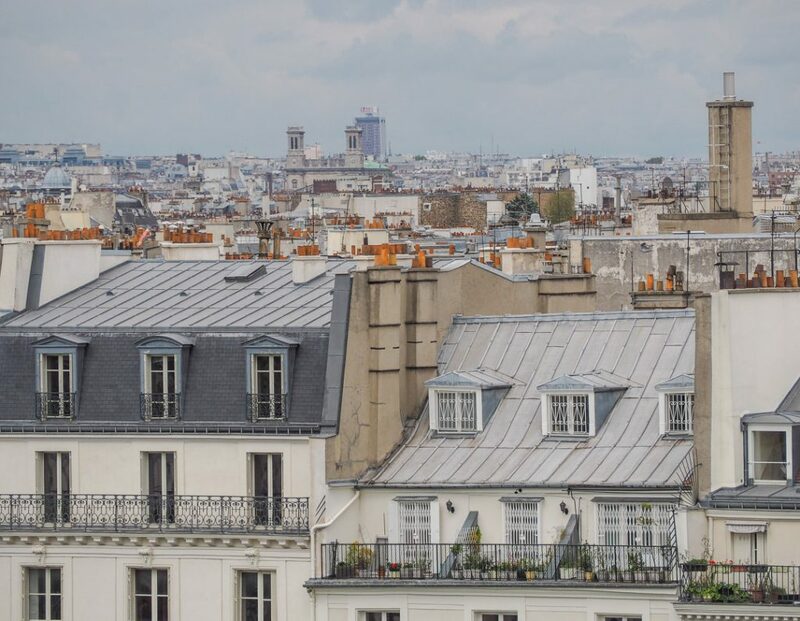 Some of the views and hues from the rooftops of Paris tour. Can you count how many chimneys you see?! 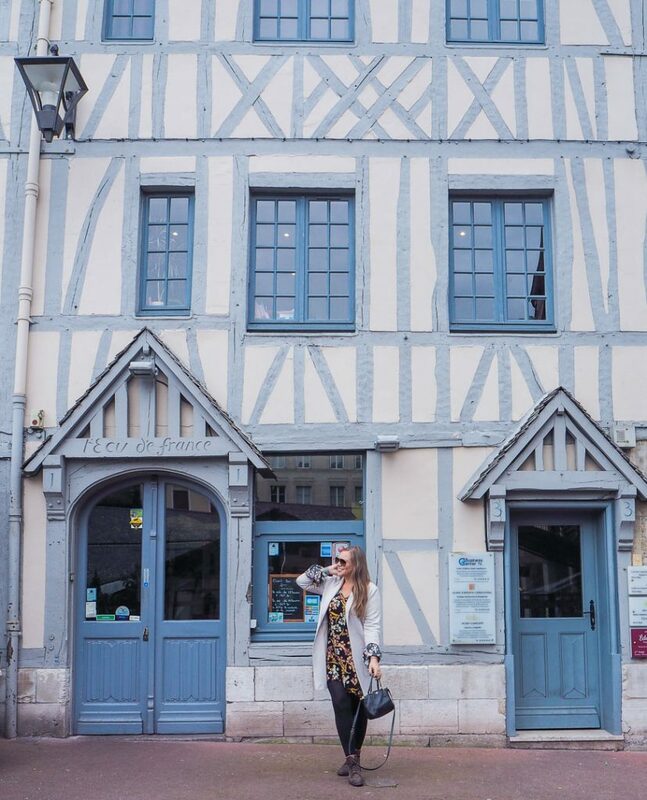 Our second stop was the quaint city of Rouen, France. We were given the option of a few tours including a bike tour, a clock-tower tour, or Rouen in the footsteps of Monet (the tour I opted for). Our tour guide was fun and informative while not being overkill. After she walked us around the main city centre and showed us a few of the highlights of the city as Monet once walked them. We were then given some free time to shop, eat, or wander some more! Totally loving all of the architecture in Rouen. Our last full day we docked at Conflans Ste. Honorine. The two tours that were offered this day were a tour of the Palace of Versailles (about a 45-minute bus ride from where the ship docked) or a tour of Auvers-sur-Oise, where Vincent Van Gogh lived during the final few months of his life. I opted for the Versailles tour and was so glad I did. As guests of The B – we had preferential treatment and were granted access into the Chapel at Versailles, which is often not allowed for Versailles visitors. 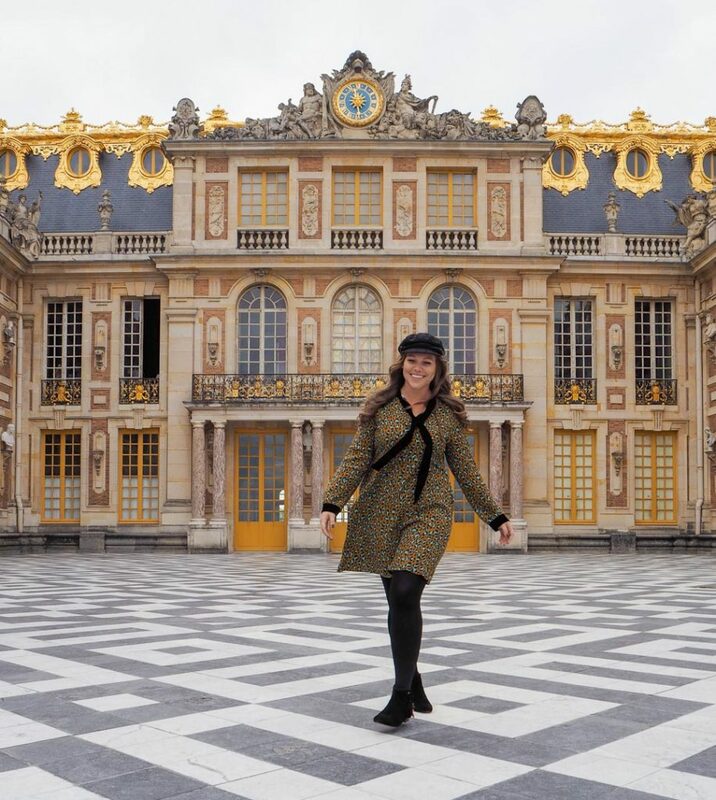 After being guided around the hot spots of Versailles (King Louis’ bedroom and The Hall of Mirrors, for example) we were given free time to explore the palace a bit by ourselves before making our way to the bus to head back to the ship. 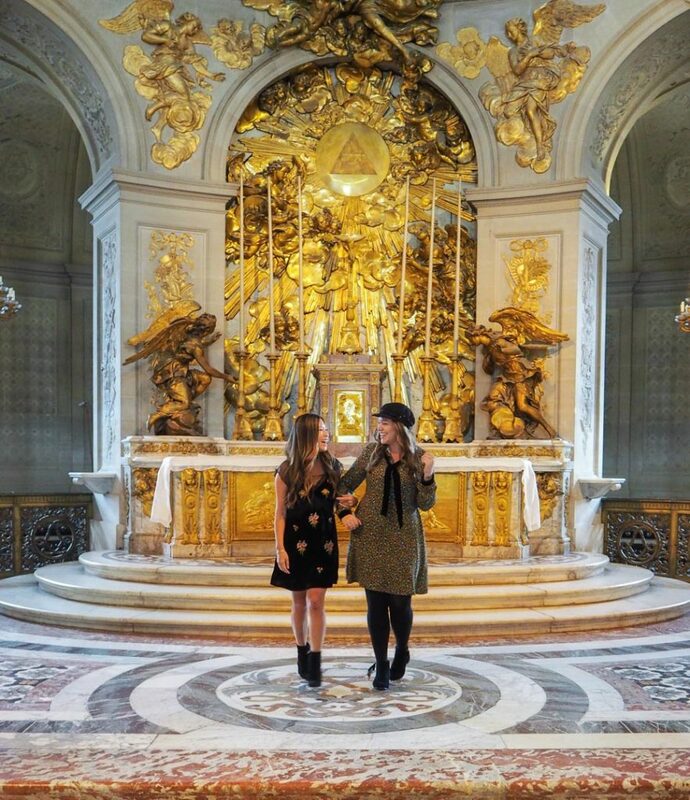 Laughing it up with Christine of Tour de Lust as we make our way around the interior of the Versailles chapel. 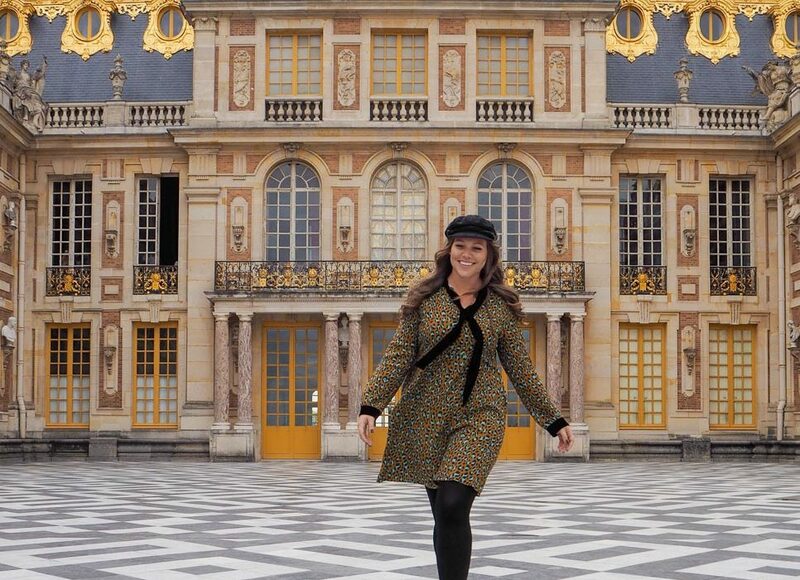 Skipping around the exterior of Versailles with our free time. I truthfully had no idea what to expect when preparing for U by Uniworld’s millennial cruise. 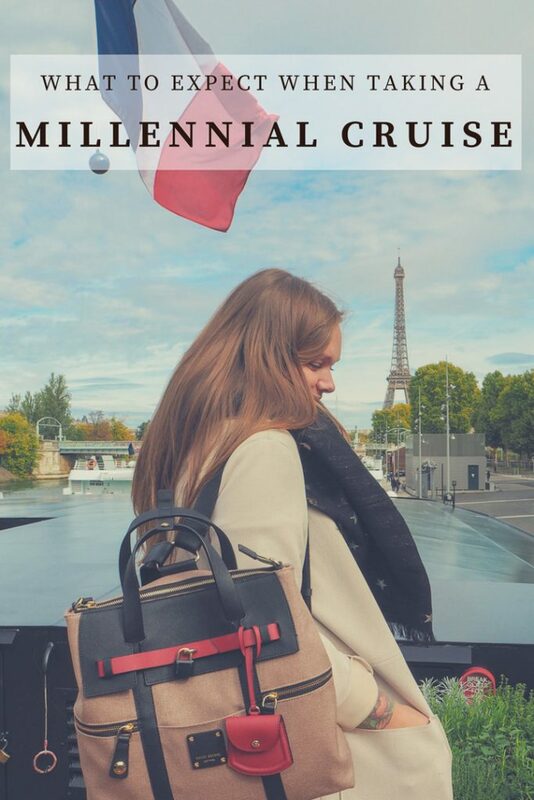 After cruising on The B I know that first class service, chic and stylish ships and décor, fun tours and activities and amenities catered to millennials are all part of the millennial cruise package! The first cruises depart in April along Europe’s most popular waterways and if I haven’t already convinced you check out U By Uniworld’s breakdown of “Why a River Cruise”. Disclaimer: I was hosted as a guest on U by Uniworld’s ship, The B. My opinions, as always, remain my own. The big question: did they serve you any avocado toast? Interesting name given they go to age 45… smack in the middle of Gen X. How fascinating! I love some of the different tour options. Did you feel like it was a bit like being in a party hostel the entire time though? And what if you just wanted to do your own thing on land? I’m so far out of the party hostel scene and I didn’t feel like that at all on the B! If you want to opt out of the tours and do your own thing – that’s totally up to you! You can do whatever you want (pending legalities LOL) on/off the ship. I love the idea of this! The brunch bus is just amazing. A perfect way to sight see. Is this the only boat they have so far? And how many does it hold? They have a few boats now! You can check out their capacities on ubyuniworld.com – i’m not 100% sure how many they hold! Were there many solo travellers on board? Was it similar to a Contiki or TopDeck tour in the way that it’s easy to make friends? I was on the launch cruise and there were heaps of solo travelers! 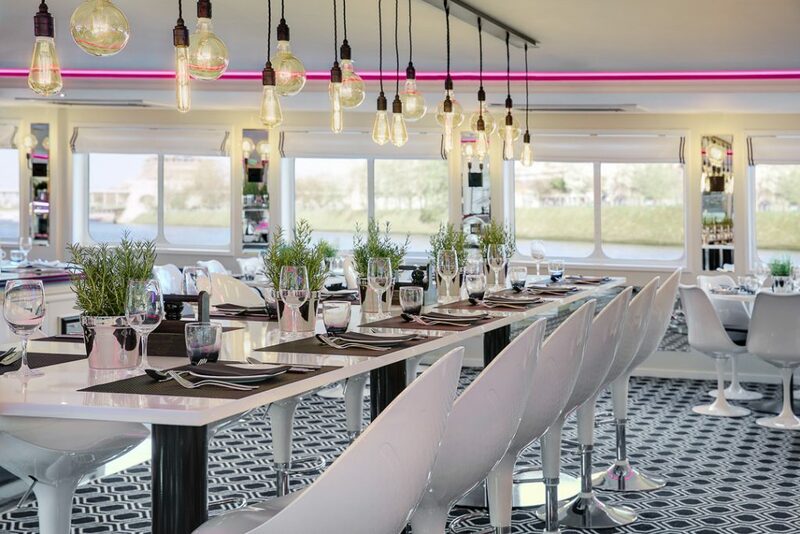 U By Uniworld is owned by The Travel Corporation which also operates Contiki so there’s very similar vibes and the group seating/family style dinners definitely promote making new friends. I’m curious to know what you thought the “average” age was on your trip. Also, did you find the costs for alcoholic drinks on the ship to be fairly priced or exorbitantly overpriced? Thanks for your feedback! Hi Ana! I was on a press preview of the ship which wasn’t open to paying customers so I can’t really speak to the average age but it seemed (from watching other bloggers/influencers’ trips) that the average age is 30ish or so. The drinks weren’t “cheap” but they also weren’t exorbitantly overpriced, either. I think, in that retrospect, they definitely catered to their millennial crowd in the add-on pricing for just about everything on this cruise.